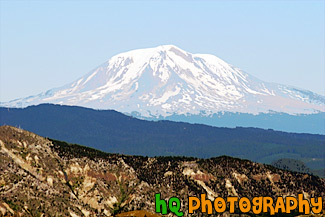 A scenic picture taken of Mount Adams seen from Mount St. Helens which is located in Washington State. Mount Adams is a stratovolcano located in the Cascade Range and the second highest mountain in the Pacific Northwest of the United States. Its' summit is 12,276 feet in elevation. Adams is located in a remote wilderness approximately 35 miles east of Mount St. Helens.